If Laura Kenny was acoustic music to the 10th power, then Coco and the Beasts was the complete and utter opposite. They made it apparent with their use of the intro to Smells Like Teen Spirit as their soundcheck. Also the fact that their lead singer was an amazingly tall Drag Queen in a kimono and high heeled boots was a pretty good indication that this is no ordinary cover band. Opening with 20th Century Boy was both brilliant and ironic. With Coco singing “Well it’s plain to see you were meant for me, yeah I’m your toy, your 20th century boy” with all her energy, it was hard not to look at the lyrics in a whole new manner. Playing just a tad faster and harder than T.Rex made it a rocking start to their set. They initially already had my attention when Coco walked on stage, but this peaked my interest. Now I still wasn’t sure what the rest of this set was going to produce. And when she started Nancy Sinatra’s haunting opening of Bang Bang, I was glued to the stage. What came next can only be described as surprisingly awesome. If you’ve ever wanted to wonder how Evanescence would do a goth rock-ish cover of that track, the Beasts helped answer that question. With the rhythm section bouncing in unison I was super into it. But their secret weapon was Lena, a girl rockin’ a mini synth to give the song that little extra dark synthy goth edge. I really didn’t know what hit me, but I certainly liked it. 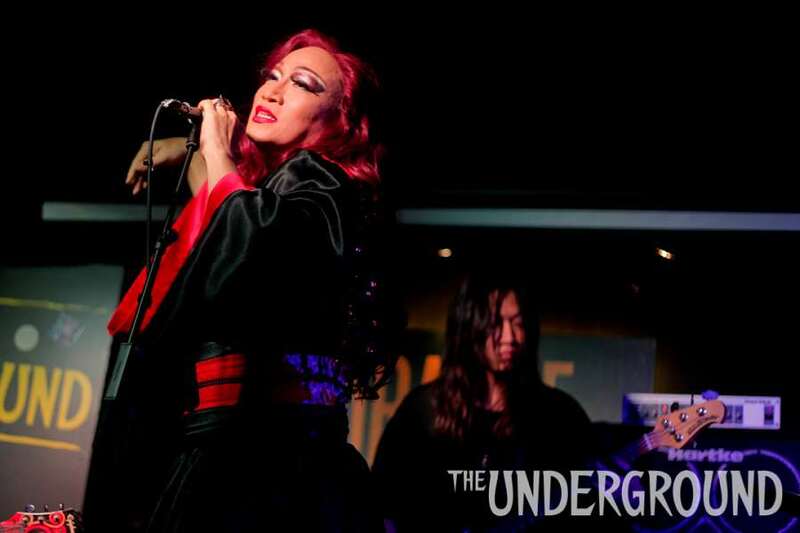 The third song 紅 (red) (Leslie Cheung cover) took an even darker turn. Although it was sung in Cantonese, you didn’t really need to understand the lyrics to know that the song was a bit angry and dark. If you’ve ever heard Alanis Morissette’s Uninvited this song had a similar vibe. They played a loop on the synth that is similar in it’s tone and darkness to Alanis’ track. It was so dark, so brooding and the halftime drums really added to the doom and gloom. I really have to hand it to these guys as their arrangements really toy with your emotions and change your perceptions of the originals. It was fitting that their last cover of the night, was a cover of a man who challenged gender stereotypes and, well really changed everything we ever knew or understood about music. David Bowie’s I’m Afraid of Americans is one of my favourite tracks, as it’s just strange and brilliant. He was a genius who made nonconformity popular. But, back to the music. This was the most standard cover they did without changing anything. They captured the original aggression and fear in the track, and with Coco’s attitude, it was a more than adequate cover of a great great song. By the way, it’s always funny that after the darkness of every song, Coco is super polite and sweet to everyone as she banters with the place. With a quick band introduction, they played, 吐息 (which sort of means to sigh), their penultimate song of the night, an original and second Cantonese song of the evening. I’m not normally a huge fan of Chinese songs in English sets, as I feel it does change the mood, but despite my reservations, I really enjoyed this song. If Andy Lau and Nicholas Tse teamed up with Evanescence and released a Canto track, it would be this song. They clearly like their stuff. Their final song of the night 交誘 (make friends) continued their slow dark theme. It had a very 90s Nine Inch Nails vibe to it. If you closed your eyes you would find yourself asking why Trent Reznor started to singing in Cantonese. But it works, despite Cantonese being such a tonally specific language it just works. As local cover bands go, they do not get any more interesting than this. As my first experience of Coco and the Beasts, this was quite awesome. I enjoyed their covers and their interpretations of their songs, but I’m more curious to see a set of all their originals.